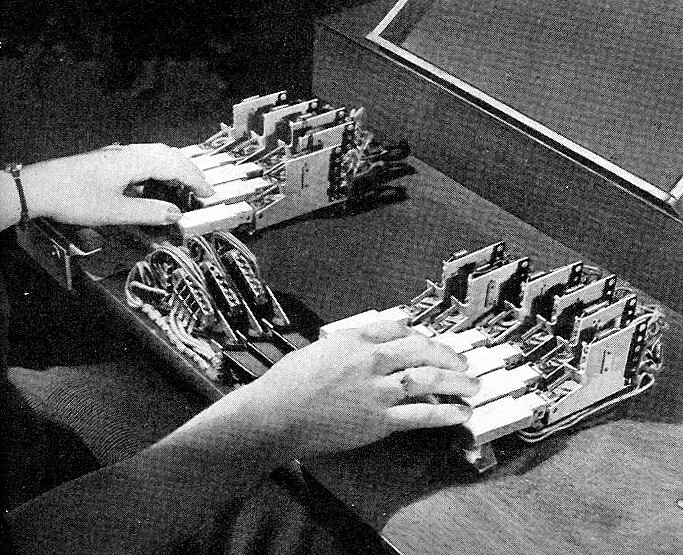 The Vocoder (Voice Operated reCorDER) and Voder (Voice Operation DEmonstratoR)) developed by the research physicist Homer Dudley, was invented as a result of research into compression techniques for telephone voice encryption at Bell Laboratories, New Jersey USA and was the first successful attempt at analysing and resynthesising the humans voice. The machine consisted of an analyser and a synthesiser. the analyser detected energy levels of successive sound samples measured over the entire audio frequency spectrum via a series of narrow band filters. The results of which could be viewed graphically as functions of frequency against time. The synthesiser reversed the process by scanning the data from the analyser and supplying the results to a feedback network of analytical filters energised by a noise generator to produce audible sounds. 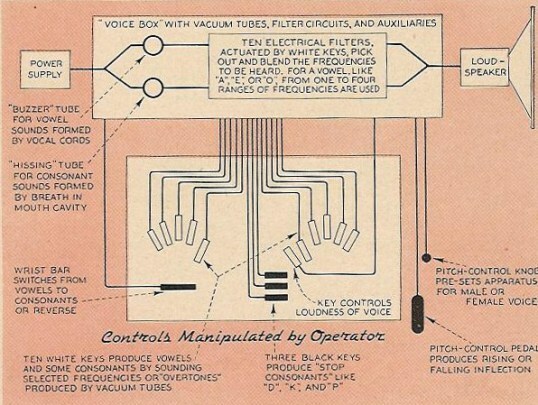 The fidelity of the machine was limited; the machine being intended as a research machine for voice over copper-wire phone transmissions. However, Werner Meyer-Eppler, then the director of Phonetics at Bonn University, recognised the relevance of the machines to electronic music after Dudley visited the University in 1948, and used the vocoder as a basis for his future writings which in turn became the inspiration for the German “Electronische Musik” movement. 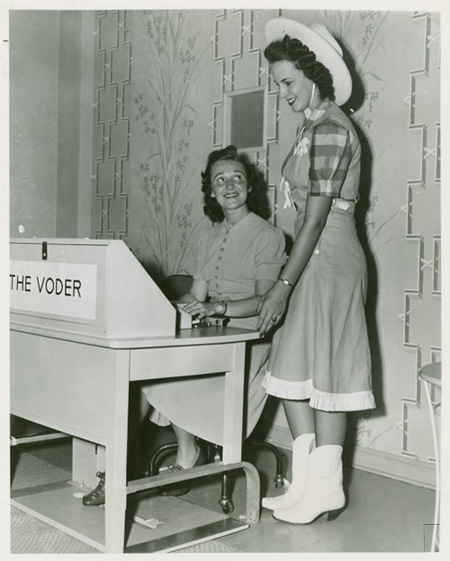 The Voder was first unveiled in 1939 at the New York World Fair (where it was demonstrated at hourly intervals) and later in 1940 in San Francisco. 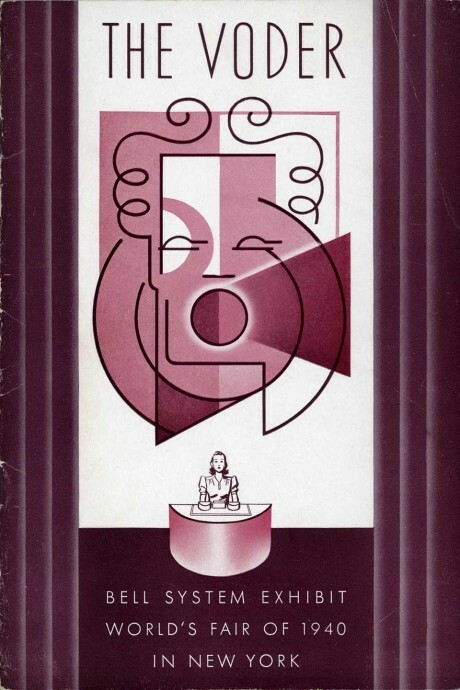 There were twenty trained operators known as the ‘girls’ who handled the machine much like a musical instrument such as a piano or an organ, but they managed to successfully produce human speech during the demonstrations. 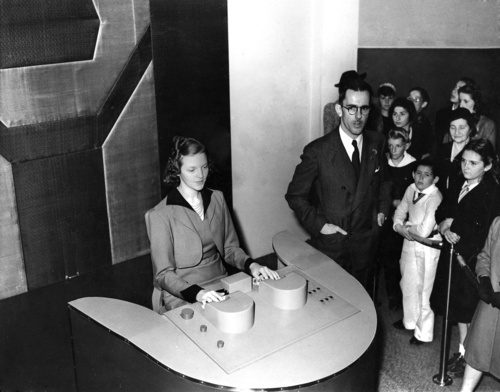 In the New York Fair demonstration, which was repeated frequently, the announcer gave a simple running discussion of the circuit to which the girl operator replied through the Voder. This was done by manipulating fourteen keys with the fingers, a bar with the left wrist and a foot pedal with the right foot. applications , that are still , both current and ongoing . what da future , shall offer us , on the planet of the Apes !!! WOW!!! I can’t believe my ears! !